Spike Lee's latest film is based on the true story of a black police officer who infiltrated the Ku Klux Klan. Rating: 3.5 stars out of 4. Spike Lee’s latest film, “BlacKkKlansman” is a howl for justice, wrapped in a you-can’t-make-this-up true story. In 1978, Ron Stallworth was a young detective on the Colorado Springs Police Department — the first black officer to achieve that title. Seeing an ad seeking new enrollees in the Ku Klux Klan, Stallworth (John David Washington) sent in an application, thinking maybe he’d learn something useful about the secretive organization. But soon he got a phone call, and just like that, a black cop — with help from a white colleague (Adam Driver) who pretended to be Stallworth during face-to-face meetings — became a member of the KKK. The deception went on for months, with most contact taking place over the phone. This is obviously a story that’s screaming to be a movie, and Lee, basing his film on Stallworth’s memoir “Black Klansman,” tells it with verve and passion; you know that this is a Spike Lee joint, from the black-and-white prologue (in which Alec Baldwin plays the racist narrator of a bizarre PSA) to its final scenes ripped wrenchingly from current events. Stallworth, played with low-key warmth by Washington (Denzel’s sound-alike son), is the quiet Jackie Robinson of the CSPD, working hard and “feeling like I’m two people all the time” — he’s frustrated both by the racism he meets from some fellow members of the force, and by the black activists he meets who refer to cops as pigs. 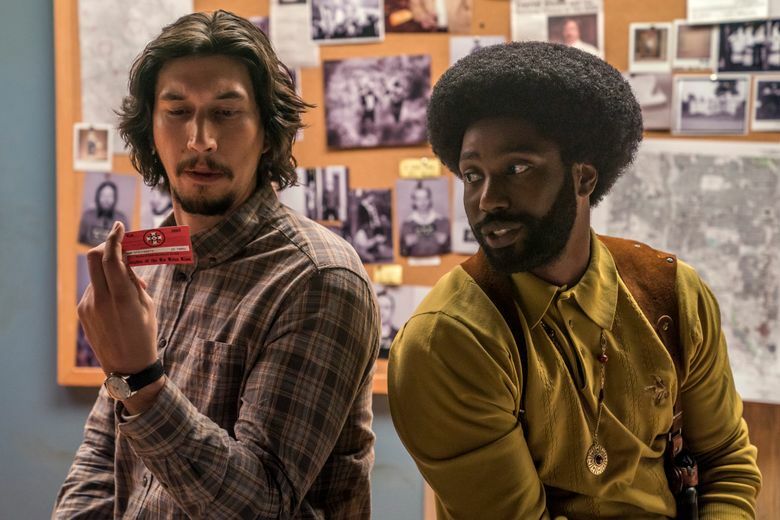 ★★★½ “BlacKkKlansman,” with John David Washington, Adam Driver, Topher Grace, Laura Harrier, Ryan Eggold, Paul Walter Hauser. Directed by Spike Lee, from a screenplay by Charlie Wachtel, David Rabinowitz, Kevin Willmott and Lee, based on the memoir “Black Klansman” by Ron Stallworth. 132 minutes. Rated R for language throughout, including racial epithets, and for disturbing/violent material and some sexual references. Open Aug. 10 at multiple theaters.